Rain. Rain. Rain. As a child, I always liked rain. It felt good, it smelled good, and it meant that my dad didn’t have to work on the farm. I remember seeing the horizon turn white in the distance as a storm approached. We only had about three minutes to get inside before we all would get terribly wet. Often, we kids would just make it inside and my mom or dad would get drenched only 30 seconds behind us. That was rain! I loved the colors and sounds of a good thunderstorm and often spent hours sitting and watching the clouds build. You could often see extraordinary lighting storms while the sky above you was bluer than the sea. Other times, the dust turned the clouds brilliant colors in all directions. A Kansas thunderstorm is always breathtaking. Later, when I moved to Germany my feelings about rain changed. I got tired of drizzle and days without sunshine. I realized, that it wasn’t so much the rain that I loved, but the storms that carried it. When I got pregnant, I decided that I wanted to make a quilt for my unborn child which also told a story. This thunderstorm quilt is the result. 1. For this quilt, you need lots of old jeans! I saved up mine for a while and was amazed at all of the different shades of blue and black to be found. The only non-jeans material, is the sun. This is an old tablecloth. 2. For the pattern, I laid out a piece of brown packing paper and drew the design. Then I laid my jeans down on the paper and started cutting pieces to fit. 3. At this point, I just started sewing the pieces together. Then I would lay them back on the pattern, cut out some more and sew again. I’m not too much of a planner when I sew, and often change my pieces as I go. 4. 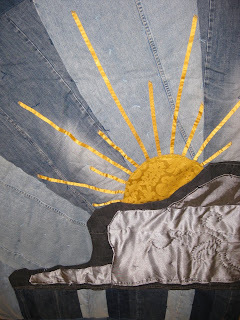 The sun was made with an old tablecloth and yellow ribbons. I only added it later, because I thought the quilt needed some color. Thank goodness I did! 5. I used a large piece of blue fleece for the back of the quilt and some polyester backing. My friends at my sewing group helped me to tie the quilt with blue thread. Then, I used the rest of some yellow material for the edges. 6. Finally, the cloud details were quilted at the end with blue thread. This is still a work in progress. Maybe, I will quilt some more at a later time. Wow! This is a beautiful quilt!! I love that it is not only a work of art and handmade but that it tells a story and has a special meaning to it! What a treasure to pass down with your son!